Join us for an action packed week of Mule events, concerts, catered dinner and BBQ, dance, the World’s Longest Mule Parade, and more, at The Bishop Mule Days Celebration! 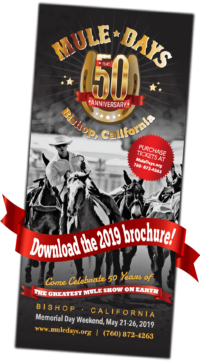 Download the 2019 Event Schedule and 2019 Mule Days Clinics Tentative Schedule. Visit the Junior Packer Booth for an “I Want to be a Packer” event schedule.